(2017). "3M Tegaderm Hydrogel Wound Filler". In (Eds.) , WoundReference. Available from: https://woundreference.com/app/topic?id=3m-tegaderm-hydrogel-wound-filler. Retrieved on 4/25/19. Amorphous hydrogel, formulated to help provide a moist wound healing environment that has been shown to enhance wound healing. Available in single-dose tubes. 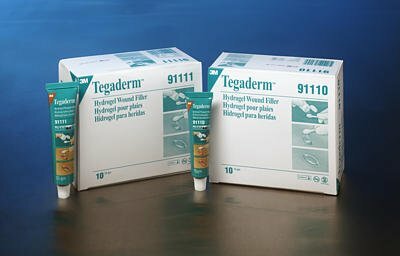 TegadermTM Hydrogel is a preservative-free wound filler delivered sterile in easy-to-apply, 15 and 25 gram tubes. It is compatible with the 3M family of dressings used for dry to minimally draining ulcers and open surgical wounds. The clear, hydrating gel promotes a moist wound environment, which enhances wound healing.